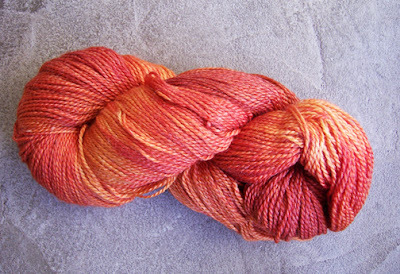 It is exactly the colorway I would have chosen for myself: the color range to which I have been so drawn lately. I needed to take the label off to get a picture of it in all its true glory, but it comes with a little sock pattern, too. I think I'll be knitting some socks soon! It's been an odd year weather wise, but I cannot complain. We've had an unusually mild and dry winter, especially after last year's torrential rains and floods. Here's hoping that everyone's weather woes will even out and you all can enjoy the spring! 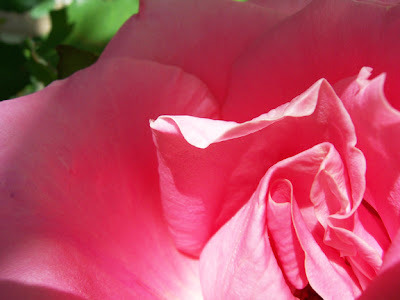 The rose is so pretty. I'm jealous. Wow, I love that yarn! Seeing these beautiful colours this morning almost made me jump with joy and doing the Dipsy Doodle Dance - what a feast for the eyes! That yarn looks particularly awesome!!! How neat, is it a rose? I love the color of your new yarn, too. Glad you liked the treat. I envy the flowers--the bulbs are just starting to peak out of the ground.